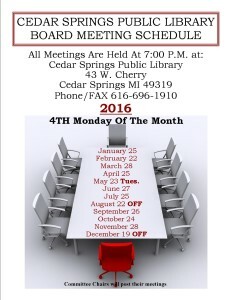 The Cedar Springs Library has a Community Room and a Classroom that can be rented out for a maximum of 6 hours. The Community Room can fit a maximum of 94 people and only seats 42 people. There are tables and chairs provided along with a full kitchen you can utilize. There is also a projector and screen that can be used for meetings in both the Community Room and the Classroom. Below is the link to the form you can fill out to rent the community room. Please make sure you check with us to see if your date has been filled before filling out the paperwork.